For West Point Grey Academy, our Vision is to be Leaders in Future-Focused Learning. Now, without the benefit of a crystal ball, a dependable Ouija board or a stainless-steel DeLorean that can hit 88mph and whisk us to the future, we must instead be sure that we are developing the right mindset: a mindset that will facilitate our focus on the future. And, if we hold true to our commitment to be inspired by our rapidly evolving world, we must specifically cultivate an Innovator’s Mindset. 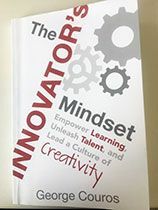 This summer the School Leadership Team read The Innovator’s Mindset: Empower Learning, Unleash Talent, and Lead a Culture of Creativity, by George Couros, Canadian author and educator. His writing is clear and concise and has a cadence that makes for an easy read. His observations are supported with illuminating examples and I’m certain this book sits heavily dog-eared on the desks of educators across the country. I am an innovative educator and I will continue to ask, “What is best for learners?” With this empathetic approach, I will create and design learning experiences. I believe that my abilities, intelligence and talents can be developed, leading to the creation of new and better ideas. I recognize that there are obstacles in education but, as an innovator, I will focus on what is possible today and where I can push to lead towards tomorrow. I will utilize the tools that are available to me today, and I will continue to search for new and better ways to grow, develop and share my thinking, while creating and connecting my learning. I focus not only on where I can improve but where I am already strong, and I look to develop those strengths in myself and in others. I build upon what I already know but I do not limit myself. I’m open to and willing to embrace new learning while continuously asking questions that help me move forward. I question thinking, challenge ideas, and do not accept, “This is the way we have always done it” as an acceptable answer for our students or myself. I model the learning and leadership I seek in others. I take risks, try new things to develop, and explore new opportunities. I ask others to take risks in their learning, and I openly model that I’m willing to do the same. I believe that isolation is the enemy of innovation, and I will learn from others to create better learning opportunities for others and myself. I connect with others both locally and globally to tap into ideas from all people and spaces. I will use those ideas, along with my professional judgement, to adapt the ideas to meet the needs of the learners in my community. I believe in my voice and experiences as well as the voice and experiences of others, as they are important for moving education forward. I share because the learning I create and the experiences I have help others. I share to push my own thinking and to make an impact on learners, both young and old, all over the world. I listen and learn from different perspectives because I know we are much better together than we could ever be alone. I can learn from anyone and any situation. I actively reflect on my learning because I know looking back is crucial to moving forward. Parents, if you’d like to discuss innovation at WPGA or share how it exists in your professional world, please connect with us so that we may keep moving forward together. We look forward to welcoming you to our Parent Curriculum Evenings next week: Senior School on Monday, September 17, 5:45pm, and Junior School on Thursday, September 20 at 5:45pm.